The Pitorra Mine is well known for its large Rose Quartz crystals and this specimen is a good example of that phenomenon. Here we have a very 3-dimensional matrix specimen of Rose Quartz. Set in a vug of Albite and Muscovite is a large, 3.7 cm crystal of Rose Quartz flanked by a smaller, 2.2. cm crystal. The finishing touch, as they say, of this specimen is an 8.5 centimeter crystal of Quartz running up the backside of the specimen which sports a halo of parallel-growth, translucent Rose Quartz. There is even a vug on the bottom of the specimen containing a 2 cm Rose Quartz. This specimen comes with a custom-made base. This specimen is a great example of the diversity of Brazil's pegmatite minerals. The Jocão pegmatite is well-known for its suite of phosphate species that have been found there. It is very similar to the famous Tip Top Mine in South Dakota for the major phosphate species found. The most recognizable of these species is the uncommon manganese phosphate mineral, Hureaulite. This large specimen of salmon\pink-colored Hureaulite is comprised of crystals measuring up to 8 mm in size, many of which are translucent. Also present on this specimen are brown-colored crystals of of the rare iron phosphate mineral, Correianevesite measuring up to 5 mm in size. The Jocão Pegmatite is the type locality for Correianevesite. This peculiar polyhedroid Agate specimen is from Paraíba, Brazil which is famous for its distinctive Blue-colored Tourmaline due to their high Copper content. These remarkable Agates were first found in 1974 by Odwaldo Monteiro and are all but impossible to obtain these days as the supply has been exhausted for many years. These anomalies of the Quartz family are occasionally seen for sale as polished slabs. It is rare that an intact example is seen for sale. I've done quite a lot of research trying to determine how these mineral oddities are formed. There are many hypotheses as to how these are formed. However, in the course of my research I have found that no two theories are the same. So just enjoy these for what they are, a most unusual Agate specimen. This specimen was part of my collection for many years. Here's a mineral association that is pretty much never seen. 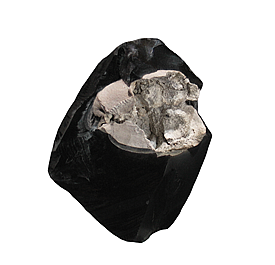 This glossy Schorl crystal is covered by translucent-transparent crystals of Amethyst. Amethyst crystals on Schorl are quite rare in the mineral kingdom. Although there have been a few instances of this association found in Namibia recently, specimens of this material from Brazil are almost nonexistent. This specimen is complete all-around with no damage. A well-formed, complete-all-around, flower-like group of Cleavelandite crystals sprinkled with tiny crystals of Lepidolite from the renowned Jonas Mine. Best known for the stunning red-hued Tourmaline that it has produced, the Jonas Mine has produced excellent specimens of other mineral species such as this one. This specimen came from mineral dealer Luis Menezes' personal collection & until recently was a part of my suite of Brazilian Minerals. A magnificent example of the replacement of one mineral species by another. This specimen features an Elbaite Tourmaline that has mostly been replaced by Lepidolite with just a few small areas of green where the Tourmaline was not replaced set in a vug of cookeite that encased the original Tourmaline. Also present in the cookeite “shell” are well-formed crystals of Quartz. 10.7 x 9.2 x 4 cm. Here we have a very geometric and large crystal of Muscovite. This shiny specimen has a good form and a metal-like lustre with a dark-bronze hue. This specimen features many well-formed groups of Muscovite intergrown with crystals of Albite. The Muscovite has a rich, dark-bonze color which contrasts nicely with the snow-white Albite crystals. A really great looking example of a couple of common pegmatite minerals that are often overlooked by mineral collectors. This deeply-colored Labradorite is from the Labrador's Nain Complex which consists of a wide variety of rock types and intrusions but is best known for this material. Labradorite is a plagioclase feldspar and is an intermediate member of the albite-anothorite series. Finding a specimen of Labradorite from the first recorded locality is rare, as all of the material on the market these days is from Madagascar. This specimen was polished on one side to show the “Labradorescence”. Labradorescence, according to mindat.org is s type of schiller, an iridescent optical interference of light caused by diffraction from microscopic sub-surface exsolution lamellae in some Labradorite samples, in particular where it contains appreciable K (potassium). This specimen, judging by the hand-written label that came with it is quite old. These specimens are the most intensely-colored, blue Cleavelandite that I can recall ever having seen in 30+ years of collecting and selling minerals. Albite is found in a wide range of environments throughout the world, and typically the color is some shade of white, grey or sometimes (very) pale-blue. These specimens were found about 10-11 years ago in an area east of Butte, Montana. To the best of my knowledge, the cause of this rich, blue color has yet to be identified. A small spray of Pyromorphite crystals that have been coated or partially replaced by the Lead mineral Plumbogummite. From a pocket collected in November of 2014. This colorful specimen features vivid, deep green botryoidal Malachite spheres overgrowing light blue Chrysocolla. The Congo Malachite specimens are in my opinion not as greatly appreciated as they should be, probably because there has been a good supply of them, but they should not be underrated. Numerous green to dark green Andradite crystals scattered on a matrix of Quartz. The crystals on this specimen range foam translucent to opaque. Examples of this material are seldom seen for sale. Here we present a very rare mineral association. When one thinks about petrified wood, one rarely thinks about accessory minerals that can be found associated with the petrified wood. These remarkable specimens were found in the spring of 2008 by insatiable digger, Ken Gochenouer. This fine specimen features many wheat-sheaf-like sprays of the mineral Barite measuring up to 1.4 cm on a manganese oxide-coated piece of petrified wood. Here we have a rarely available mineral species and specimen. This euhedral, gray Anorthoclase Feldspar is also double-terminated and exhibits twinning. The specimens from the crater of Mt. Erebus, near the USA's McMurdo Station in Antarctica are considered to be some of the best examples of the species known. They can only be collected during research trips to the summit of Erebus, which is accessible only by helicopter, and are very rarely seen for sale. Mt. Erebus Volcano is home to the world’s only persistently convecting anorthoclase-phonolite lava lake. A very very unusual example of Flint that has filled an animal burrow creating a cast. I don't really know how to describe it other than to say that this thing is really cool! These specimens were recovered around 5-6 years ago by Frank deWit & Alfredo Petrov. A vug of Stilbite crystals in an aggregate of contrasting Orthoclase crystals with scattered flecks of Biotite. This specimen is made up of groups of well-formed, bone-white crystals of Analcime. The largest crystals on this specimen measure 7 mm in size. Point Sal is a location near Vandenberg AFB, whose access has now been permanently restricted for over seventeen years. 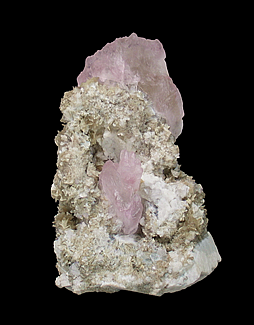 This specimen feature numerous crystals of Quartz on a Matrix of Fluorite. Quartz is very uncommon from the Fluorite mines of Southern Illinois. Open for only a short time in the mid-1900s, the Deardorff Mine is not one of the household names when it comes to Illinois specimens. However, it had a unique association of Fluorite and Quartz which are still one of the more sought-after Illinois classics to this day. For whatever reasons, Quartz is rare in the other nearby mines, particularly in association with Fluorite. The Deardorff mine was THE specimen mine of the 1930's-1950's. It closed in the early 1960's. A large example of Hematite, known in this form as “needles” or “needle ore”, although due to its size, this one seems to me, to be more of a spike than a needle. This complete-all-around specimen has beautiful ribbing and a nice, patina. This piece hails from a classic and famous Wisconsin iron mine - the Montreal Mine in Iron County. A cluster of intergrown, golden-amber-colored Colemanite crystals on Matrix from the Boraxo Mine, Inyo County, California. Some of the crystal faces on this specimen have beveled edges This is classic, old-time material. The Boraxo Mine is located inside Death Valley National Park, and collecting is not allowed. This sawn and polished Opal nodule has to be one of the most unique Fluorite combinations in the mineral kingdom. The nodule has a good lustre and porcelain-like texture. This highly unusual Fluorite varietal is called Tiffany Stone. Tiffany Stone is a mix of Bertrandite, Fluorite, and Opal. The name is of uncertain origin. Folklore wrongly attributes the name to Tiffany and Company of New York which used purple colors in its decorative glassware. It is unique to this obscure Utah beryllium deposit. A hemispherical gray-white Cristobalite nodule filling a gas cavity in shiny black Obsidian matrix. The “eyes” or spheres of high temperature Cristobalite (SiO2) are the result of devitrification, or loss of silica from the Obsidian. The hot springs are part of the geothermal activity of the Coso Volcanic Field located within the boundaries of the Naval Air Weapons Station China Lake and collecting is not allowed.